Quality Leadership – What does it take? So what is it that makes a great leader? If you do a quick online search some answers that pop up are an ability to delegate, communication, ability to analyse, people skills, confidence, sound judgment, commitment to task, positive attitude, positive behaviour, creativity, intuition and ability to inspire to name a few. All of these qualities and more are great for a leader to have, some of these are skills that can be learnt over time through experience and practice while others are related to cognitive thinking capacity which is something that is much more difficult to develop. In fact, some people are of the opinion that cognitive thinking capacity will remain relatively stable once someone reaches early adulthood. I don’t intend to get into that argument in this piece but I will be touching on some of the leadership qualities that are closely related to cognitive thinking capacity, how they are applied in practice and what the relationship is to a great leader, which can be the difference between total disaster and success for an organisation. You are the General Manager of a beer brewing company that distributes products across Australia and internationally. Over the past couple of months there have been issues relating to the quality of some of your products when they reach the consumer, such as off taste, smell and discolouration of the beer. When these issues came to light you removed the offending batch of products from sale, increased quality control measures and implemented a major internal investigation to determine the cause of the bad quality product. The cause of the issue has yet to be identified however no more bad quality products have been found during the increased quality control process. Weeks later you are watching the news at home when a breaking story is aired about two related deaths from an unknown cause at a pub that your company is a major supplier to. A shiver runs down your spine and then your phone rings, with trepidation you take the call. On the phone is the chief of police in charge of investigating the mysterious deaths and he informs you that it appears both people had been drinking your company’s beer at the time of death and initial tests have shown the beer contained cyanide. The chief tells you he is on route to your house and will arrive in 5 minutes to discuss the crisis with you. So let’s image you are in the General Manager’s role and now have 4 minutes until the chief of police knocks on your door. What are your first thoughts? How would you handle the crisis? What are the critical things to consider? A proposition I’ll put to you is that first of all you will need to analyse the situation to understand what is happening, not much of relevance can be achieved without sound analysis to determine the possible causes, implications and knock on effects of the crisis. Once you’ve analysed the situation and have an understanding of what is happening your mind will then start trying to come up with ideas to solve the issues, this is where your creativity is needed if you are to successfully direct the crisis to the most satisfactory outcome possible. Now of course to successfully navigate a crisis like this you will need to consider how to apply your analysis and creativity (known as Pure Thinking) in practical terms. For example who are the people that will be affected by the crisis and the ideas you’ve come up with to solve it, both immediately and into the future? And what are the things (tasks) that need to be done to achieve the best outcome for your company and all the other people involved? These are complex issues that we all naturally will think differently about. Careful judgement needs to be used when a leader’s Pure Thinking is practically applied to a critical situation at a moment’s notice. 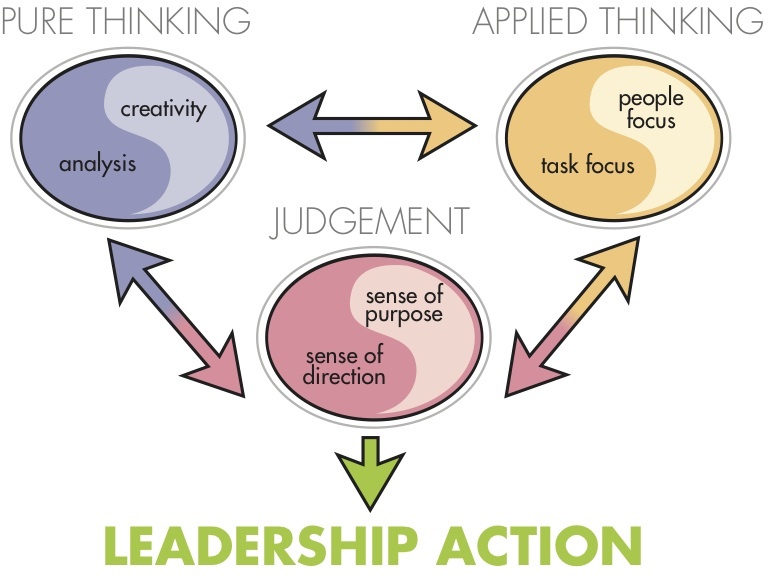 The balance of Pure Thinking qualities (analysis and creativity) and the Applied Thinking qualities (people and task focus) of a leader along with the judgments they make in a moment of extreme crisis can be the difference between organisations and empires toppling or surviving to fight another day. Now let’s think about how important it is to have balanced leadership qualities. What might happen if you have great analysis of the crisis but poor creativity? Or focus too much on tasks to the detriment of the many people involved? If this was the case I imagine that your conversation with the chief of police could be catastrophic. You would be able to understand and articulate what is going on but wouldn’t be able to come up with ideas to control or manage the situation to a positive outcome. Also, you may overlook or not consider some of the people connected to the crisis even though your plan will impact them both immediately and into the future. Your conversation with the chief may not go well: you would be pushed for a course of action on the spot but struggle to come up with an appropriate plan. In the heat of the moment, you may not consider the various people connected to the crisis, which would have an irretrievably negative impact on many people, including the future of your organisation. On the other hand, if you have balanced Pure Thinking qualities and can handle the complexity of the situation you could immediately start to navigate the issues to the most positive possible outcome for all involved. There are people out there that can handle dealing with amazingly complex challenges in a balanced way at a moment’s notice. They might even be working in your organisation already, waiting to be identified and given the right opportunities to develop. The Qualities of Leadership model and Floreat’s related talent identification methodology Talentfinder has been developed by Floreat Consulting through years of studying successful leaders in large organisations and practical application to identify people with the potential to succeed at the highest levels in a variety of different roles.